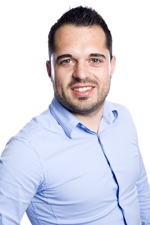 After obtaining a master degree in Applied Economics from the University of Antwerp in 2009, Dieter started his professional career as a Project Consultant within TriFinance. The service offering of TriFinance focuses on financial consulting, combining services – advice, temporary support, and recruitment and selection – in a pragmatic, value-added package that fits the exact needs of their clients. After leading several interesting projects, Dieter shifted his focus to the internal organisation of TriFinance as a Business Process and Systems Analyst in 2012 focusing on applications linked to applicant and candidate tracking. After two years of working internally, Dieter became the Support Unit Leader of the new IT department. Four years later, the IT department is now comprised of nine people in charge of business partner and operational support for different departments in Belgium, Germany, and the Netherlands. A key success factor in the setup of the new IT department was and still is investing in the development of people and offering them growth paths. The implementation of Connexys as TriFinance’s new ATS system is on of the main achievements. In addition to setting up the new department, Dieter has been actively involved in ensuring TriFinance’s organisational and departmental compliance with impending GDPR legislation.